Axle Contemporary, housed in the back of a custom retrofitted 1970 aluminum stepvan, presents Nostós Fetish Machine, an installation by Annika Berry with megaphone audio, surveyor’s tripod, television, lyrics. 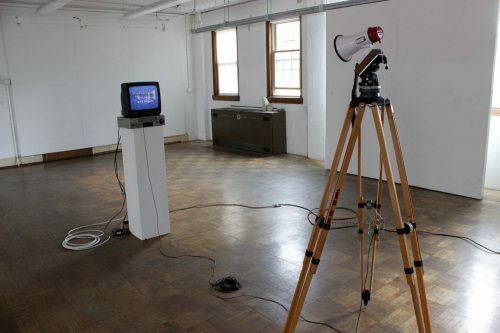 Nostós Fetish Machine is a dialogue between a megaphone and a television set. The two inanimate objects are locked in sync as text continuously appears and is read aloud. The dialogue imagines history as something that can touch, be touched, and touch itself, proposing the act of narrating history as both pleasure-seeking and violent. Fluctuating in tone from apologetic, to monotone, to accusatory, the machine implicates viewers as it recites its increasingly defiant lyrics. This exhibition is part of Currents New Media Festival (June 7 – 23) and Santa Fe Institute’s InterPlanetary Festival (June 14 – 16). Visit Axle Contemporary’s website for more information.